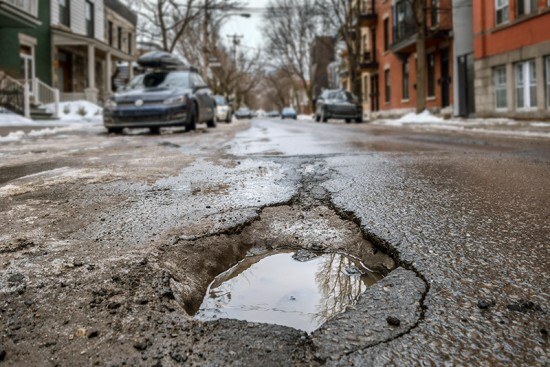 The countless potholes that seem to open up all over the road during the winter can do a number on the alignment of your wheels, and you shouldn’t wait too long to have it corrected. Regular wheel alignments are an important part of good vehicle maintenance, as poorly aligned wheels can severely limit the performance of your vehicle. Many drivers, however, only have their wheels aligned when they purchase a new set of tires. While driving over potholes and curbs can knock a vehicle’s alignment off in one big jolt, even regular, everyday driving can gradually take a toll on alignment. Your vehicle’s wheel alignment has an impact on its suspension, steering components, and tires. There are two major benefits of having your wheels properly aligned: to keep yourself and your passengers safe while driving, and to save money. A vehicle with an improper alignment has far less steering precision, and is therefore much less comfortable and less safe to drive. When your vehicle pulls to the left or the right, then your handling and your response time are compromised. You may not be able to react quickly enough to get yourself out of dangerous situations, and your car may drift too far away from centre if your attention lapses for even a moment. Adjusting your steering in order to compensate for misalignment is far more dangerous and inefficient than simply having your wheels aligned. Though a wheel alignment does incur a small short-term cost, it can actually lead to long-term savings, particularly on the cost of tires. Tires on misaligned wheels are going to wear down much faster and need replacement significantly sooner than tires on wheels which are kept properly aligned. Keep your wheels aligned and your tires should last as long as advertised. With a proper wheel alignment you’ll also get to enjoy better fuel efficiency. Wheel misalignment effects how well your tires can work together, which in turn has an effect on the efficiency of your engine. A less efficient engine is going to need to guzzle more fuel in order to provide you with the power you need. On top of saving money on tires and gas, making sure your wheels are aligned can also save you money on auto repair. The components of your vehicle’s steering and suspension systems are put under excess stress when the tires are misaligned, causing them to break down faster and potentially requiring you to pay for costly repairs. Drivers who know the signs to look out for can quickly tell when their wheels are misaligned. The most obvious indicators are when your steering wheel is straight but your vehicle pulls to one side, or when your vehicle is driving straight but the steering wheel isn’t centred. If your vehicle is pulling because of a misalignment, you may also feel a vibration in your steering wheel. Wheel misalignment will cause your front tires to wear unevenly as well. If you notice any of these signs, then don’t hesitate to have your vehicle’s alignment checked out by a professional. Catching a misalignment early can save you a lot of trouble and headaches in the future. A certified professional will have your vehicle driving straight and true in no time.